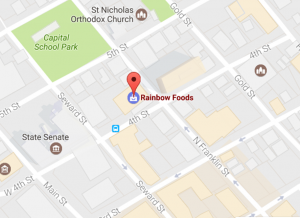 If you are looking for a health food store in the downtown area, Rainbow Foods is the place to go. It is located just up the road from the pier on 224 4th St. The store is dedicated to helping customers maintain a healthy lifestyle. Their website not only highlights their offerings, but also provides a cross reference for items that can be helpful for common health conditions. They will even offer recommendations for local health practitioners. Upon approaching the store from the docks, you will be greeted by a seating area in the midst of a beautiful herb garden. Inside, the store features colorful art with a spacious and clean layout. 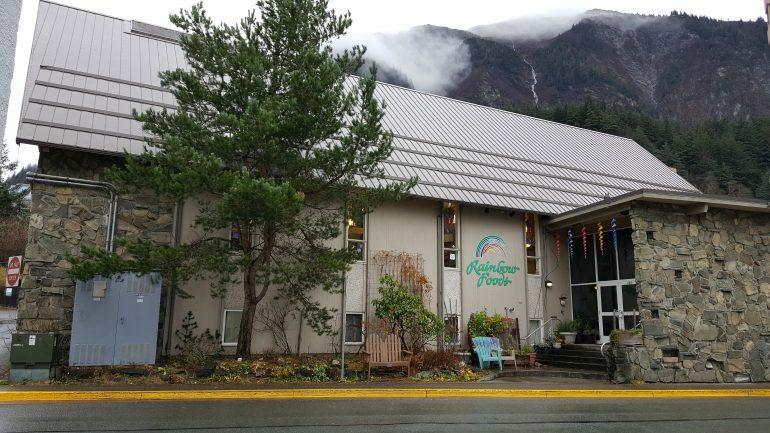 It has the largest selection of organic produce in Southeast Alaska, according to the website of the Independent Natural Food Retailers Association, and it offers local and national brands of natural groceries, supplements, vitamins, household items, bakery items – including locally baked Wild Oven Bakehouse items, and a lunch bar. The store offers cozy seating areas to enjoy your lunch as well as a natural pharmacy. The staff is friendly and helpful. Like most health food stores, the cost is pricey, especially when you consider most products must be either shipped or flown in by air. But if you are looking for vegan fare, gluten-free, or just a refreshing break from the processed and heavy vacation foods, Rainbow Foods will set you up nicely.